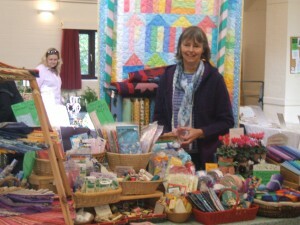 The Chagford Friday Market, Jubilee Hall, Chagford, Devon TQ13 8DP. Every Friday from 10am – 1pm. Hope to see you there! Always lots of bargains. Chagford Friday Market is a very colourful event, with lots of stalls including plants & flowers, cakes & cheese, books & cards, textiles, antiques & curios. Refreshments available, good disabled access. Adjacent Car park . Chagford itself is a delightful Moorland Town, that is easy to reach from all parts of Devon. It has a good selection of pubs & cafes. Visit the famous emporium Bowdens & a wealth of charming shops. Thank you to all of you who’ve come out to the Stall. Great to meet the quilters who came in a bus from Helston, Cornwall & quilters from Barnstaple, North Tawton & many local quilters too. We now have assorted coloured felt, beads, bells & sequins on the stall.